Though it is considered that Zvenigorod was founded in 1152, archaeologists say that the first settlement on that site appeared in the second millennium BC. Today Zvenigorod is mostly associated with the name of the Russian satirist and playwright Anton Chekhov. After graduating from the medical faculty of Moscow University, the young doctor and writer Anton Chekhov worked in Zvenigorod. According to the local tour guides, Chekhov gradually became friends with his neighbors – and they began to invite him to drink tea with raspberry jam, and often for stronger drinks as well. This group spent great times at a table under a linden tree in front of Chekhov’s house. With every passing day, the number of those people wanting to join in the merriment increased and the celebrations grew louder, and so it was every evening until the early hours of the morning. This bothered respectable cottagers, and they wrote a complaint to the local gendarmerie about the “rowdy” Chekhov. He was fined. The house on the street called Malinovy Ovrag (Raspberry Ravine), where Chekhov lived, is now a museum. 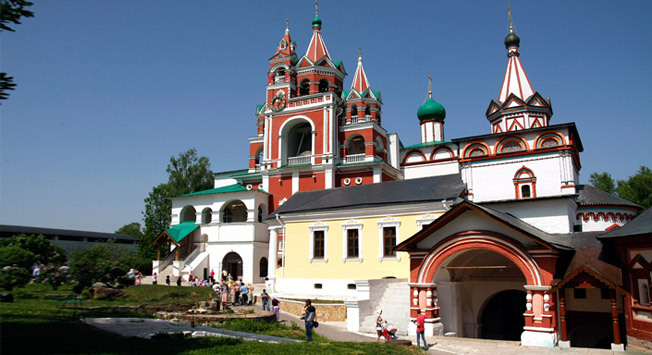 Let us start with the main temple of the city, the Church of the Ascension (2a Moskovskaya Street). In the 16th century, there was a wooden church with the same name located here. Later in its place, they built a stone church. In 1941, the church was destroyed. The village, founded in the 14th century, was named in honor of the landowner Fyodor Dyutki. In the 19th century, the village gradually became a fashionable holiday settlement, which was often visited by artists Levitan and Savrasov, as well as Chekhov, who worked nearby. There are no parking problems in Zvenigorod. All parking is free. In chain stores and in most cafés, you can pay by Visa or MasterCard, but you might run into problems, so it is best to have some cash (rubles) always on hand.